Paul Seifriz studied Industrial Engineering with Business and Management training. He looks back on 15 years of experience as an executive member – mainly in purviews of mangement and organisational responsibilities, general management, organizational developments, controlling & accountancies, Quality Management, IT Training, etc. 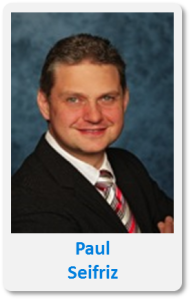 Since the year 2004, Paul Seifriz is acting as Management Consultant – focusing mainly on i.e. quality management, the implementation of pull and ToC based supply chain, production and distribution systems, systemic organizational and strategic company policy developments. He is also working as senior lecturer at different academies. On account of his excellent skills in psychotherapy and tutoring Paul Seifriz is today one of the leading specialists in the area of systemic organizational and personal development.